The elegant batsman of the Lankan Lions, Kumar Sangakkara, blasted another ODI ton and Nuwan Kulasekara stunned England as the visitors won the match easily. England scored 293 runs for the loss of seven wickets in the allotted 50 overs and Sri Lanka piled up 3-297 in 47.1 overs. Kumar Sangakkara (Sri Lanka) was declared ‘Player of the match’ for his commanding unbeaten knock of 134 runs. The 8th match of the 2013 ICC Champions Trophy was played on Thursday, June 13, 2013, at Kennington Oval, London. Earlier, Angelo Mathews, the skipper of Sri Lanka, won the toss and invited the hosts to bat first. 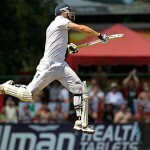 The captain of England, Alastair Cook, along with Ian Bell opened up slowly by scoring 38 runs in 10 overs with 4 fours. Bell was gone at 48 after scoring 20 runs and was replaced by Jonathan Trott. Cook was dropped at 23 in the 15th over and they crept to 100 after 23 overs. Alastair Cook reached his 17th ODI fifty in the 50th over and was dropped again at 56 as Trott kept on consolidating at his end. Cook was finally declared leg before wicket off Rangana Herath for 59 off 85 balls with 3 fours. Joe Root walked in next as Jonathan Trott attained his 21st ODI half century in the 34th over as the batsmen started picking the boundaries at regular intervals. Root accomplished his 4th limited overs fifty in the 42nd over and took the partnership to 218 overs. Jonathan Trott was held lbw off Herath for 76 off 87 with 5 fours. Root added another 3 fours in the coming overs as Malinga struck twice in the 46th over. He removed Joe Root for 68 off 55 balls with 5 fours and Eoin Morgan was gone for 13. Ravi Bopara played a brisk unbeaten knock off 33 from just 13 balls with 3 lofty sixes and 2 fours as England scored 293 with three wickets remaining in 50 overs. Lasith Malinga, Shaminda Eranga and Rangana Herath shared two wickets each whereas Nuwan Kulasekara held one. The Islanders lost their first wicket at 10 when Kumar Sangakkara joined in with Tillakaratne Dilshan. The duo kept on scoring at a reasonable pace, they scored 67 in 14 runs and added 17 runs in the following over with 1 six and 2 fours. Dilshan was caught by Root at long on at the bowling of Graeme Swann for 44 as the total reached 102 in 21 overs. Mahela Jayawardene appeared in the park next and Sangakkara got his fifty in the next over. The chase was kept alive by the batsmen as Jayawardene hit 1 six and 3 fours in the coming overs but was caught by the substitute off James Anderson for 42. Nuwan Kulasekara associated with the smooth going Sangakkara who powered his 15th ODI hundred in the 39th over. The Lankan Lions required 76 from the last 60 deliveries as Kulasekara took over by dispatching 2 sixes and 3 fours in the following overs and smashed his third ODI fifty on just 30 balls with 1 six and 2 fours in the 44th over. Kumar Sangakkara hit the winning boundary on the first ball of the 48th over as the Islanders hammered 3-297 runs. Sangakkara secured his end for 134 off 135 with 12 fours and Nuwan Kulasekara was on the other side at 58 off 38 mere balls with 3 towering sixes and 5 fours. James Anderson was the main wicket taker with three whereas Graeme Swann claimed one wicket. Sri Lanka clinched the game with a big margin of seven wickets and got them back in the event while getting two points.